TIME MAGAZINE : BEST inventions 2006. Many people asked me about what kind of material the sticky pads made out of and there is a large spectrum of surface energy. As I learned more about molecular mechanics, however, it is getting more convincing to me that adhesion is depends more on geometry of structures than the type of material. In the beginning of RiSE (Robots in Scansorial Environment) project, winter of 2003, I was wondering about the mechanism why sticky stuff stick on surfaces. What feature makes things sticky? My hypothesis was that the more compliant the structure of a system, the stickier it is. One approach drawn from this concept is very simple Adhesion system model that I made in Jan 2004. As mentioned in adhesion model, surface conformation is essential in adhesion since Van der Waals force is very weak unless there is intimate contact between two surfaces. Van der Waals force is known to be very weak, although its usage is ubiquitous in our life. Most common example is conventional tape that uses very soft material for compliance. Vertical climbing on various surfaces requires more sophisticated system than single thin layer of soft polymer used in tape. In natural and artificial environment, roughness in many length scale is presented. Thus, in order to maximize the number of molecules in intimate contact between feet and wall surfaces, corresponding length scale compliance is needed. Gekco species also present hierarchical compliance in their body. 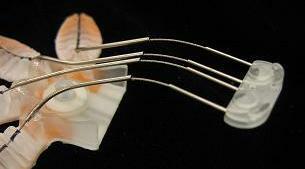 Flexible body and leg can conform at the centimeter scale. Toes and soft skin are responsible for 1~2 millimeter scale. Within a millimeter scale, specialized hair structures are composed of lamellae, setae and nano scale spatulae covering up to nanometer scale. 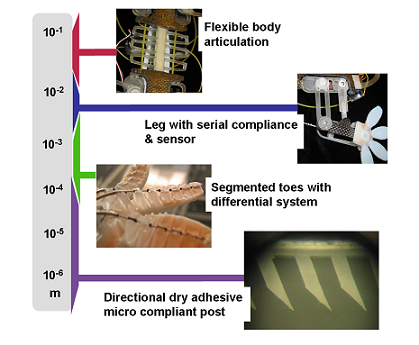 Stickybot inherits similar characteristic comprising 12 active actuator, 8 DOF serial and 4 passive compliant DOFs in leg and 16 segmented toes controlled via two stage differential cable driven system. The most extraordinary feature of Stickybot is Directional adhesive. 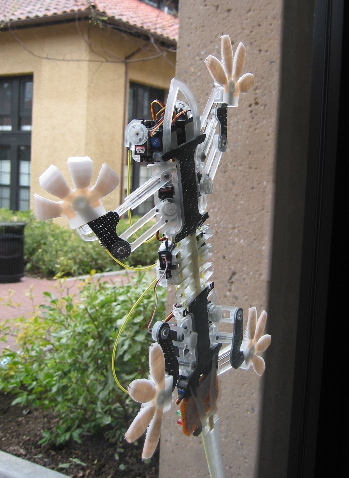 Climbing robot are not It has Anisotropic structure featured controllable adhesion with directionality in adhesion force. The movie clip demonstrates directional adhesion compared to conventional double sided tape. Unlike conventional tape, it sticks on smooth surface with very small preload and is also able to detach with by reducing load. If it is loaded in desired direction, it creates maximum contact minimizing stress concentration along the contact area. if it is loaded in wrong direction, the adhesion force is very low. What makes Stickybot unique is its extraordinary design of foot. Its foot has four segmented toes controlled by single push-pull cable via two stage differential system. Three different polymers are used and stiffened by fine fabric to minimize shear stress concentration along adhesive pads. It took me about three month to finalize design iterating more than three times. Utilizing high surface energy of poly-urethane, we can test various adhesive pads on Stickybot feet. Its interesting curvature of cable path is designed carefully in order to ac hieve well distributed normal force on the contact area. Since each toes has seven segments, it can conform non flat surfaces. 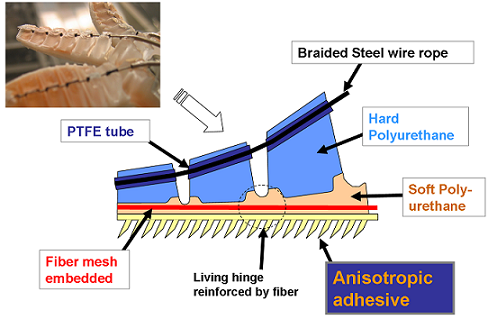 Despite its flexible structure, reliable adhesion requires elaborated force transmission system from cable tension to normal pressure on contact surface. Its desired profile is calculated in such a way shown on the diagram on right. 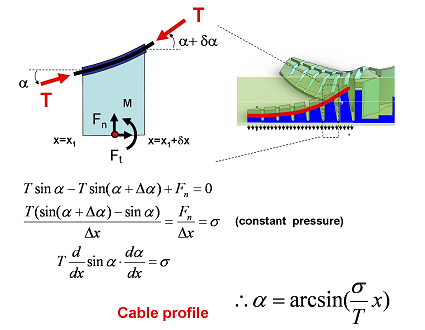 Basic idea is to create uniform normal pressure that caused by cable angle differentiation. Each segment should have same amount of force assuming constant cable compression force. Differential cable system is employed in order of minimizing number of actuators and force balance among four toes. One equivalent mechanical system is double rocker bogie system.Upper stage differential actuation is rocker and one cable connecting two toes enables lower stage differential system.